Getting a truck loan instead of purchasing equipment outright might be the best road to take when large machinery is part of your arsenal. Business owners are constantly analyzing and strategizing on how to best run their companies and part of that involves making the most prudent decisions when it comes to equipment. Save your cash. Business owners have other expenses they need to consider before making a decision to buy or lease. Getting a truck loan can free up cash for unexpected things like repairs or contractual surprises. Be masterful with money. Construction company ownership is pretty demanding capital-wise. So, you’ve got to keep that cash flowing, especially in an uncertain economy. Cash lets you continue to work, even when you’re behind on receivables. It will also let you keep on working when others can’t due to diminished cash flow. Top notch equipment. Getting a truck loan will also give you the best on the market and the best for your particular needs. Leasing gives you the advantage of the newest technology without laying out all that cash and putting a serious damper on your cash flow. And there’s always the issue of depreciation. The longer equipment is used, the lower its value becomes. Leasing assets that depreciate may be more financially smart. Credit building. Lenders always look favourably on business owners who have already borrowed and paid back. That kind of credit history makes it easier to get money in the future. And since you may have the need to get your hands on capital, continuing to build your credit is a good idea. Tax sensibility. There are some leasing contracts that will let you write off some expenses when it comes to tax time. As a business owner, you should always be looking at ways to save your dollars and getting a truck loan might be one of those ways. Your accountant will be able to tell you how. 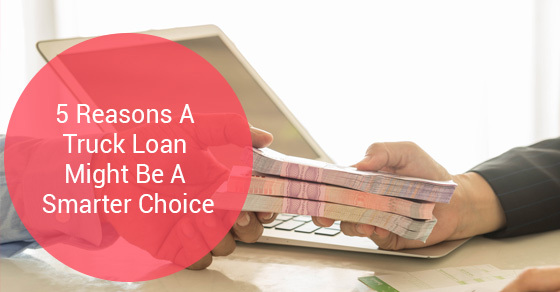 So, if you’ve been thinking about purchasing equipment, you may want to seriously consider a loan instead. There are many options and the folks at Truck Loan Center will sit down with you and come up with a plan that’s suitable to your specific needs. Set up an appointment with them and get the best advice for your equipment needs.